Dental caries is the most common dental and oral disease in Indonesia, which is 45.68% and is included in the top ten diseases suffered by the community. Household health survey showed that 90.05% of Indonesians suffer from active dental caries or untreated dental caries. Based on data from Basic Health Research (RISKESDAS) in 2013, the average decayed, missing, and filled teeth (DMF-T) index of East Java province was 5.5 with tooth decay (D) of 1.6, missing teeth (M) of 3.8, and teeth filling (F) of 0.08. In a preliminary survey conducted on mothers in subdistrict area in Trawas, East Java, Indonesia, it was found that nine out of ten mothers examined had dental caries. The high incidence rate of dental caries in mothers can be caused by several factors, one of which is improper habit of brushing teeth. A mother with group aged 20–50 years is most likely severe from dental caries. In the study conducted on 110 respondents, was obtained the average value of DMF-T as much as 7.37. One of the factors that cause the number of caries teeth that many is improper habit of brushing teeth, including how and when the right time to brush their teeth [Table 1] and [Table 2]. Nearly, 84.9% of mothers who had high DMF-T score are having a wrong toothbrushing habit. The mothers who brushed their teeth improperly had a higher percentage of DMF-T (7.37) than those who brushed teeth properly. This is because not all parts exposed to the toothbrush so that the remaining food and plaque remain on the surface of the tooth. In tooth surfaces that are not completely cleaned, plaque buildup can increase the risk of caries. To prevent the risk of increased DMF-T index score, the health promotion program in the area must be conducted. There must be some cooperation from the village leader, public health center head of the department, stakeholders, and the mother community itself. The first step is to put together the planning group for the program, and hoping that the individuals or groups invited can affect or be affected by the programs. Empowerment is a good health promotion and has been described as the “holy grail” and the main concern of health promoters. Originally, the term was applied to process which combated oppression and injustice, enabling communities to work together to increase the control over their own lives and health. From the background and the results of interviews that had been conducted by researchers, the program was conducted which later aimed to intervene the risk factors of way and time of brushing teeth at subdistrict area of Trawas, East Java, Indonesia. This program includes Dental and Oral Health Education (DHE), using video playback media which contained about the importance of maintaining oral hygiene, toothbrushing, and sticker distribution. This study is an observational-analytic study with pre- and post-test design. All the procedures done in this empowerment has been approved by the subdistrict government representation and Trawas, public health center. Respondents have filled the informed consent. 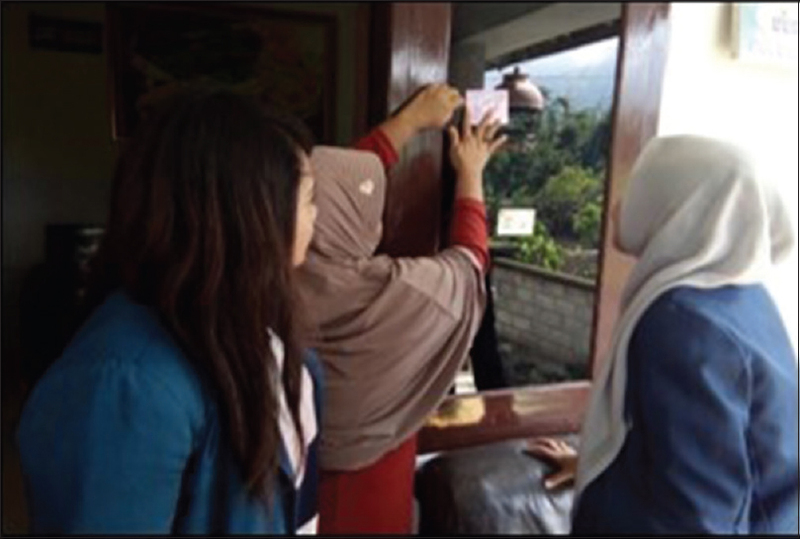 This program took place at Trawas subdistrict public health center, Trawas, East Java, Indonesia. The sampling used the simple random sampling which selected 75 mothers (aged 20–50 years) in target area who was invited to join the program. The program was running for 2 days: the activity program day and evaluation day. This program was conducted in May 2016. All the respondents who were the subject in this study had filled the informed consent that stated their willingness for intraoral examination and filling questionnaire. Ethical approval for performing this study has been obtained from the Research Ethics Committee of Faculty of Dentistry Universitas Airlangga, with the number of ethic clearance is 82/KKEPK. FKG/VI/2016. The formal approach was done through the head of Trawas public health center and government representative leader of Trawas subdistrict. The approach was in the form of explanation of the correct way and time to brush teeth. This approach also conveyed that it was important for mothers to prevent the increasing number of cavities. The nonformal approach was done through door-to-door visits and invitations distributed to Trawas subdistrict, about the empowerment program. The method of empowerment done in this program was giving a Dental and Oral Health Education (DHE) by playing a video about the importance of maintaining oral and dental health then given with video explanation followed by a demonstration on how to brush teeth properly. It was followed by question and answer session about dental and oral health, and the distribution of sticker which contained the material about brushing teeth properly. This program research program activity can be seen in [Figure 1], [Figure 2], [Figure 3]. First, counseling was done with the material of the knowledge of dental and oral health impacts that caused caries and other dental and oral health problems. Second, the examination of food scraps through disclosing agents and video screening about the way and time of brushing was then conducted. Third, the demonstration by mothers and question and answer session to evaluate the understanding of mother in Trawas subdistrict, and the respondents were also given a pretest right before the DHE was given. At the end of the program, the respondents are given a posttest to measure their knowledge of dental and oral health after joining the program. The questions are around dental and oral health and how to maintain their oral hygiene. The questionnaire used in this study has been tested for its validity. The validity test for the questionnaire is done by finding a correlation between the scores of each question (r result) with the r value in the table. The validity test is done twice until all questions are considered valid. Each question is declared valid if r results have a positive value and r results > r table, that is at the significance level of 5%, for n = x then the value of r table = x. To be declared valid all questions must have a positive r value and value > x. The results of the validity show all valid questions. The respondents are able to demonstrate the correct way of brushing teeth, answering some dental health questions, and way more active to ask questions about dental and oral health. The enthusiasm of respondents was very high during the counseling on how to maintain dental hygiene, and at the time of question and answer about dental and oral health problems as well as the absence of rejection when sticking stickers at home residents. The last stage was an evaluation. The evaluation of the program was done 2 days after the activity. The evaluation was done by running a posttest. The success of this empowerment was reviewed by the questions which were successfully answered by the respondents who had previously joined the program. There is a significant score increase in the posttest, comparing to the pretest results. The health promotion program is needed in Trawas subdistrict. An appropriate program is needed to make a target community receive health promotion (knowledge of dental and oral health) well. The program must know the problems that occur and intervene in the problem, especially to improve certain habits of the community. It is the responsibility of a dentist, a dental hygienist, and the medical worker in their area to help and make oral health programs available. To become effective and efficient health promoters, it is essential to broaden our minds away from the narrowness biomedical model and understand the complex interplay of factors affecting health. Practice and discussion method are found out to be the most effective way to deliver a health education. This form of health education is based on the learning through observation. There is a difference between knowing how to do something and actually being able to do it. The aim of a demonstration is to help learners become able to do the skills themselves, not just know how to do them. The respondents were given a video about the proper way to brushing teeth and a demonstration how to do it. In a developing country, health promotion can be conducted by making empowerment programs, also to improve the social quality of life, not just giving them dental health materials. To arrange the program, it will need to adopt a systematic approach to planning. It has been proved that DHE results in positive dental habits that lead to improve oral health. Starting prevention program in population with multimedia tools more favorable, because a multimedia instructional environment has an enormous potential to improve the people capability to learn. That is why we used video as a DHE material. A learner who receive material in forms of verbal and pictorial static such as photos or illustrations and dynamic content such as video or animation films. Their encouraging the ability to understand can be enhanced by the addition of visual forms of presentation. Group discussion involves the free flow of communication between a facilitator and two or more participants. After given the theory and knowledge, the respondents are given permission to ask and answer the question about oral health. In this session, the respondents were way more active to talk about dental and oral health, based on their new knowledge. From their respond and enthusiasm to joining the group discussion, we can conclude that the program is success to elevating the knowledge and concern about the dental health problems. The increase of posttest result, comparing to the pretest result, is an indicator that the respondents are well-receiving the health promotion message. The empowerment program ran smoothly, as evidenced by the enthusiasm of participants in each session of the program. It can be seen with the quality of questions raised by respondents and program evaluation of questions posed were successfully answered by respondents who had previously done the empowerment. Authors would like to thank the Department of Dental Public Health, Faculty of Dentistry, Universitas Airlangga. Sugito F. The role of tea in preventing dental caries. J Kedokteran Gigi Universitas Indonesia 2000:7:375-9. Trihono T. National Basic Health Research (RIKESDAS). Health Research and Development Agency of the Indonesian Ministry of Health; 2013. p. 101-10. Rompis C, Pangemanan D, dan Gunawan P. Relationship between the level of maternal knowledge about dental health of children with caries severity of kindergarten children in Kota Tahuna. J E Gigi 2016;4:47. Bartholomew LK, Markham CM, Rutler RA, Kok G, Parcel GS. Planning Health Promotion Programs: An Intervention Mapping Approach. US: Jossey-Bass; 2016. John K. Health Promotion. London: Oxford University Press; 2015. p. 31. Alrmaly BA, Assery MK. Need of oral health promotion through schools among developing countries. J Int Oral Health 2018;10:1-3. Susan R. The Essential Guide to Public Health and Health Promotion. UK: Routledge; 2014. Jackie G, Keith T, Ruth C, James W. Health Promotion: Planning and Strategies. London: Sage Publication; 2015. Worthington HV, Hill KB, Mooney J, Hamilton FA, Blinkhorn AS. A cluster randomized controlled trial of a dental health education program for 10-year-old children. J Public Health Dent 2001;61:22-7. Alhayek AI, Alsulaiman MJ, Almuhanna HA, Alsalem MA, Althaqib MA, Alyousef AA. The effect of conventional oral health education versus animation presentation on the perception of Saudi males in primary school children. J Int Oral Health 2018;10:121-6.